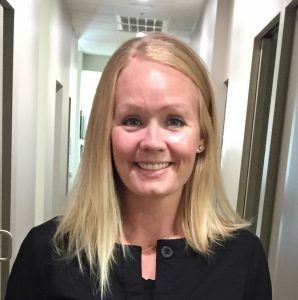 Trista is our hygienist! Her job is to make sure that your teeth are clean, so you don’t get cavities. Even thought that means you won’t be spending as much time with Dr. Mike, his feelings won’t be hurt. He would rather for you to have a clean mouth without cavities, and that’s what Trista is here for. But wait, there’s more! Trista will be able to make your whitening trays, make your mouthguards, and recommend protocols to make sure that cavities are a thing of the past for you. She was in the Navy for 8 years, so you know she’ll whip you into shape! She lives in the Katy area with her husband and three kids.